A new world class pigeon has come to the fore: Best Kittel. 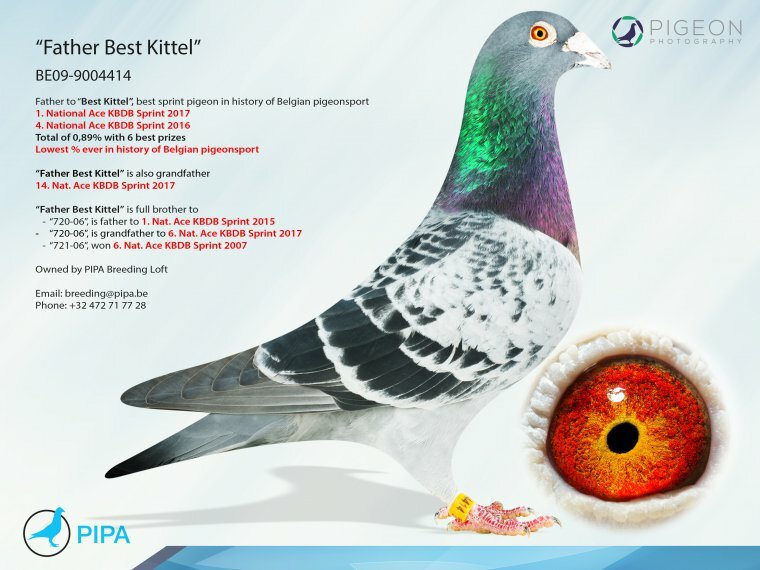 This fantastic pigeon was able to win the title of 1st National Ace Pigeon Sprint KBDB with the lowest coefficient in the history of pigeon racing in Belgium (0.89%). He is indeed a truly unique champion, perhaps the best ever. Records are meant to be broken, although one has to wonder if we can get our pigeons even better, even faster. Top class pigeon Best Kittel showed in 2017 that there is still room for improvement. He delivered some exceptional results, with which he was able to set a new record on his way to his national ace pigeon title sprint KBDB. 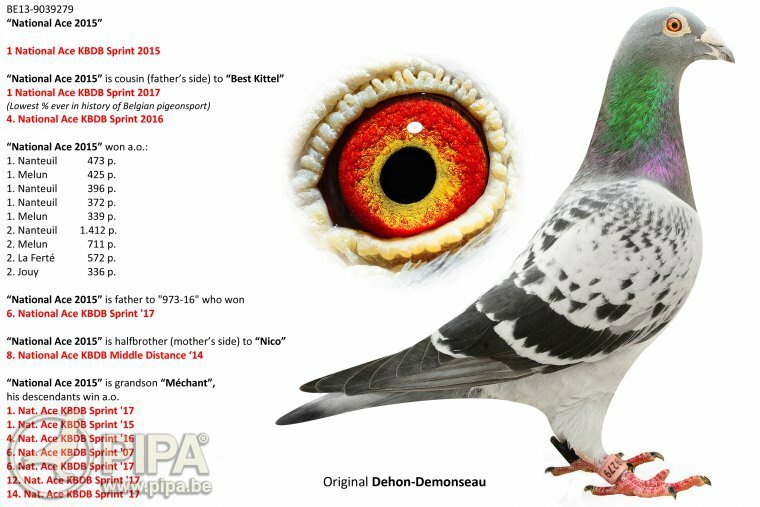 He is the most gifted pigeon ever to have raced around Belgium. Best Kittel won a title of 4th Ace Pigeon Sprint KBDB as a yearling in 2016, showing a first hint of his enormous potential. He gave it everything he had in 2017, outperforming the rest of the country with a title of 1st Nat. 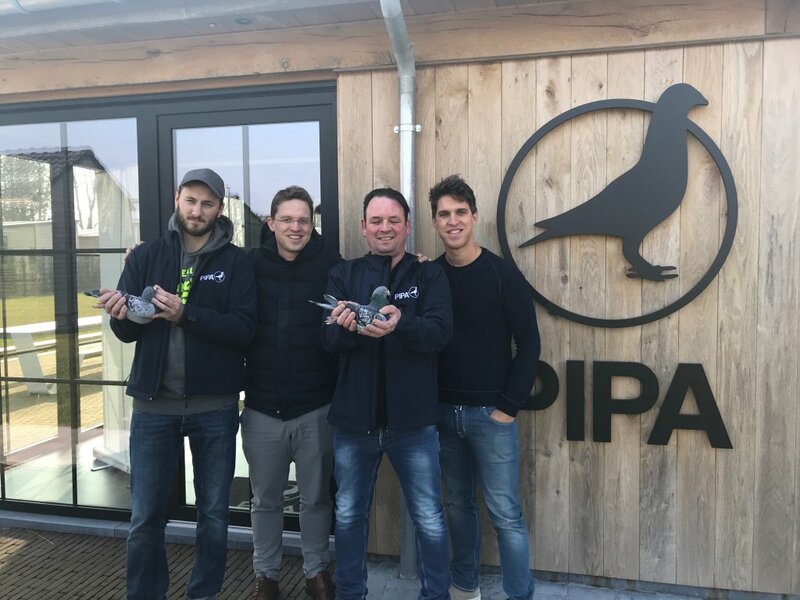 Ace Pigeon Sprint KBDB, which he won with the lowest coefficient ever, achieving the lowest percentage (of 0.89%) in the history of pigeon racing in Belgium in a national sprint championship! These prizes were won in the lofts of Daniel and Mee Hae Dehon-Demonseau from Thulin (BE), very close to the well known release site from Quiévrain-Pommeroeul, in the province of Hainaut. The sprint competition is stil very alive in this region, which is home to many sprint fanciers. This is also the home base of sprint champion Marc Capelle (Baudour), winner of 3 x 1st Nat. Ace Pigeon Sprint KBDB in 2002-2008-2014 and triple winner of a 1st Nat. Champion KBDB 2012-2013-2015, as well as a six time winner of a 2nd Nat. Ace Pigeon Sprint KBDB. In ohther words, there is some fierce competition in this Belgian province. The achievements of Best Kittel are by no means a coincidence. 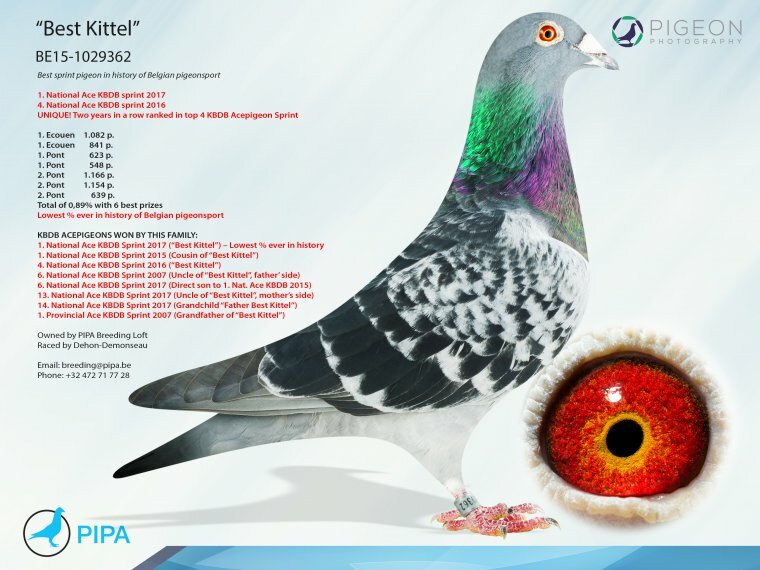 His family has been winning several national ace pigeon titles, and his pedigree is a fine combination of ace pigeons. 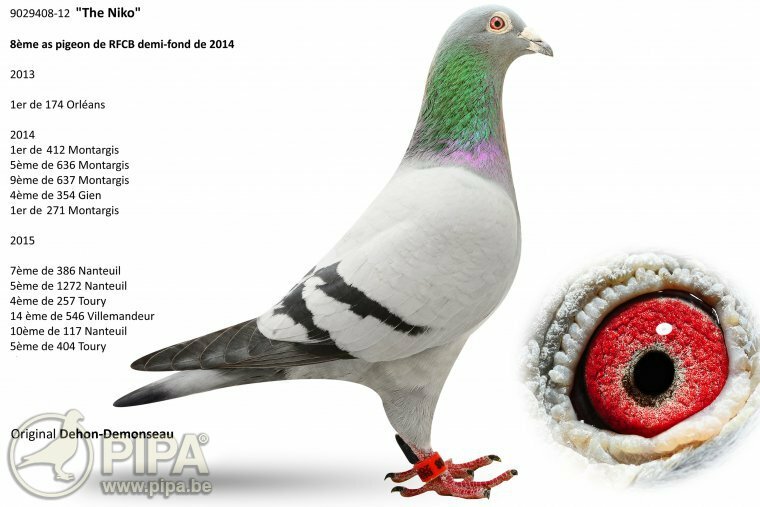 Ace pigeons breed ace pigeons, and their race winning abilities are an integral part of an ace bird's bloodline; any experienced fancier can tell you that, and it has been said in numerous race reports as well. Best Kittel clearly illustrates this: he comes from a pairing in straight line to stock sire Méchant BE05-9081201, as a youngster of a son x granddaughter Méchant. If any pigeon fancier would master the art of creating breeding pairs that are 100% guaranteed to deliver national ace pigeons, that man (or woman) would probably be a millionaire. Still, breeding ace pigeons is not really matter of coincidence but rather a matter of luck. As a fancier you can try and increase your luck by pairing two gifted pigeons, or ideally two race winners or two ace pigeons. It all depends on what you have available. A carefully thought out pairing will increase your chances of success, and could make the road to the top a bit shorter. When the team from Thulin decided to pair the two parents of Best Kittel, they did not expect (or hope) to be getting such a fantastic, record-breaking racing bird. But that does not mean this pair had been put together just like that; there was a clever breeding strategy behind it. The two parents come straight from the team's number one provider of national ace pigeons: stock breeder Méchant. They are in fact a son x granddaughter, making for two super class pigeons. Does it get any better? Méchant is the grandfather of not one but two 1st Nat. Ace Pigeons Sprint KBDB in three years' time: Best Kittel and his nephew. Winner of 5 first prizes, 4 second prizes, etc. These pigeons have some excellent origins indeed! 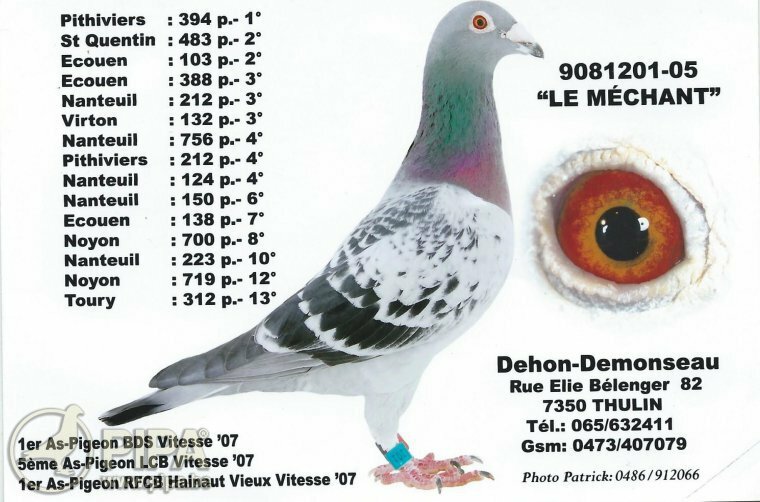 A fantastic breeding bird and a direct son of the top pair that consists of stock breeder Méchant BE05-9081201 (1st Prov. 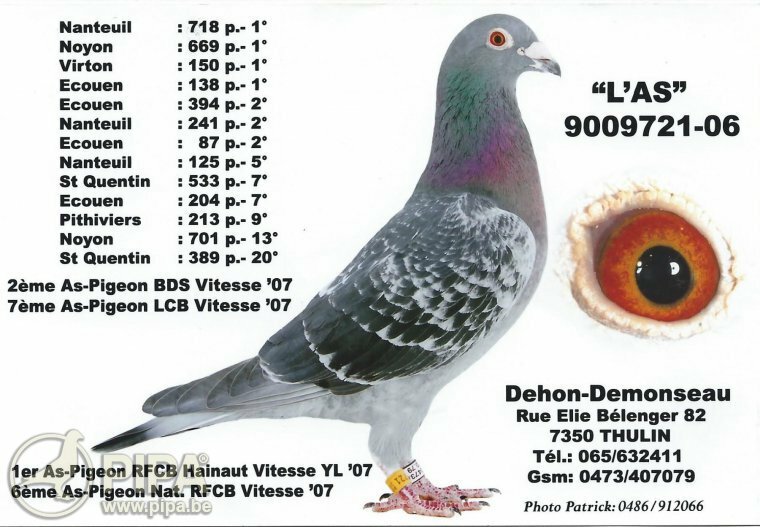 Ace Pigeon Sprint KBDB 2007) x Super Breeding Hen BE05-9080824. They are the grandparents of two 1st National Ace Pigeons Sprint KBDB: Best Kittel and National Ace 2015. -Father National Ace BE06-9009720: the sire of National Ace: 1st Nat. Ace Pigeon Sprint Olds KBDB 2015. Like we said earlier, National Ace is in turn the sire of a 6th Nat. Ace Pigeon YLs KBDB in 2017. This is an exceptional ace pigeon bloodline indeed. 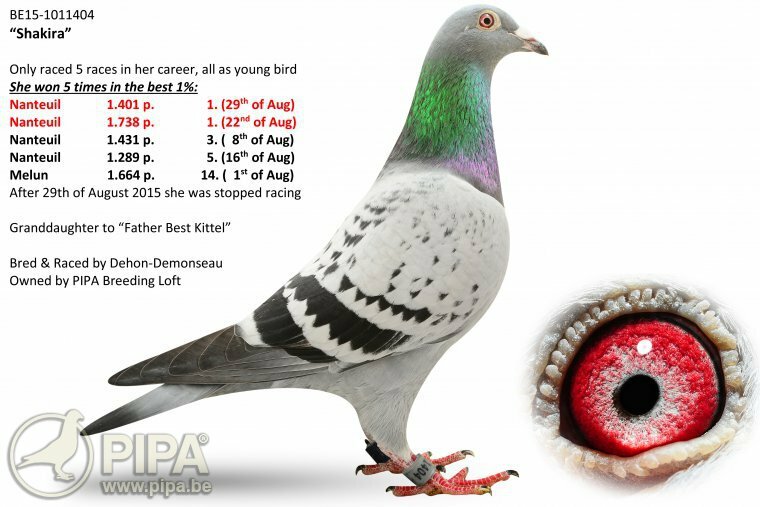 This young bird completed just five races, and she wins a 1-1-3-5-14 against more than 1,200 pigeons. She finished in the top 1% in each of these five races, which is quite a rare feat. This is a fantastic hen. She was still a one year old hen in her first year in the breeding loft when she bred Best Kittel. In addition, her own nest brother BE14-1034372 won a title of ​13th Nat. 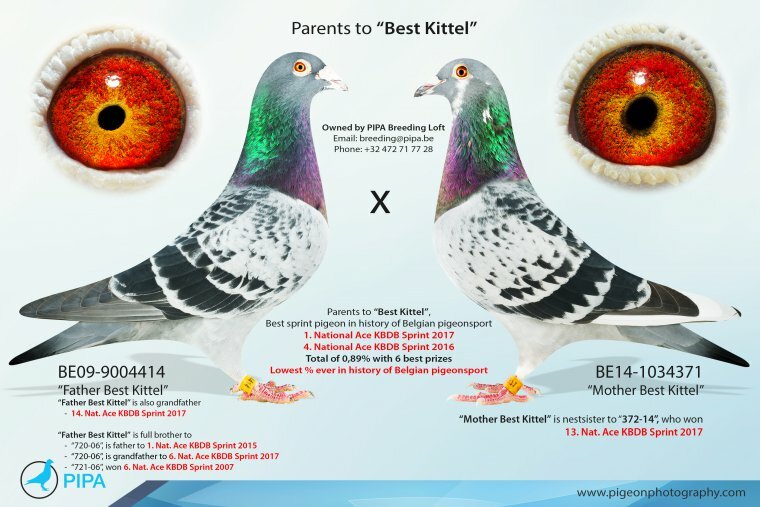 Ace Pigeon Sprint KBDB ​old birds ​in 2017. 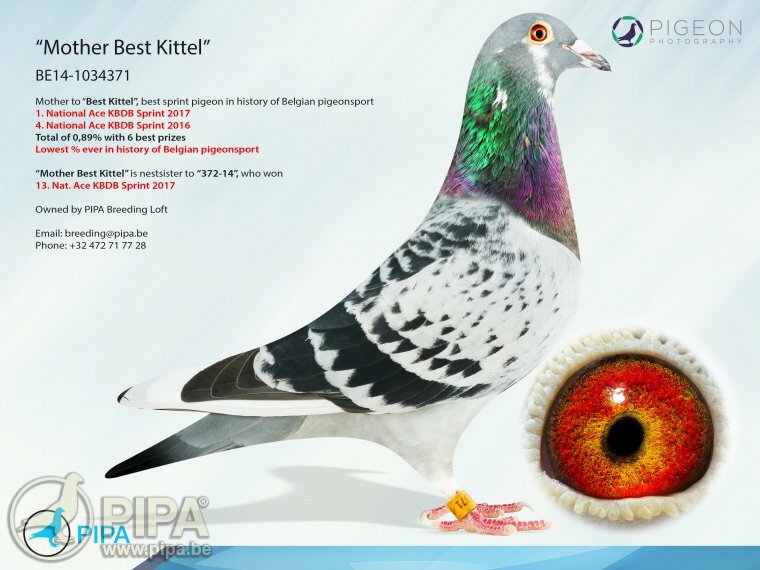 It shows that Mother Best Kittel ​is quite a gifted hen, and her pedigree reveals that she originates from several ace pigeon bloodlines as well. 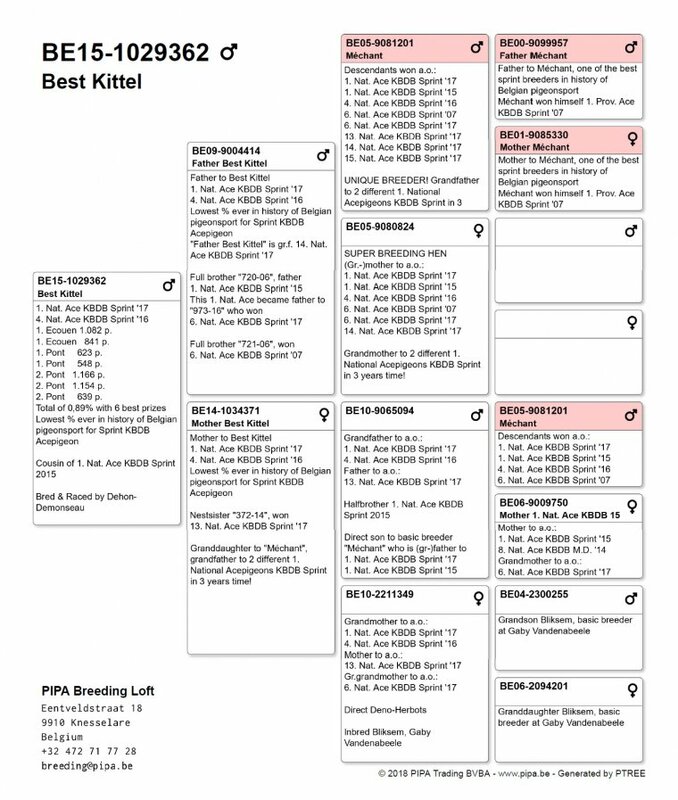 And to further add to the number of super class bloodlines, Mother Best Kittel stems from Inbred Bliksem BE10-2211349 from her mother's side. Inbred Bliksem is a direct Deno-Herbots, and a daughter of the pairing of grandson x granddaughter of the ionic Bliksem of Gaby Vandenabeele. It is something we have seen so many times in the past: an exceptional ace pigeon (for instance Best Kittel) that develops into an exceptional breeding bird later on. They become stock breeders that really have an impact on the races, breeding new champions, first prize winners and ace pigeons. One thing's for sure: a talented pigeon the likes of Best Kittel has an unusual combination of bloodlines that allows them to achieve exceptional results, and to stand out from the others. They become the number one in their discipline, simply because winning first prizes (or a combination of speed, endurance and orientation) is an inherent characteristic for them. And if you can get the most out of their genes, you might be able to create of a new world class breed. Think of such illustrious names as As Vandevelde, Kannibaal, or New Freddy. Each of them had been a 1st National ACe Pigeon KBDB, before developing into an exceptional breeder. And this is what the PIPA Breeding Loft of Thomas Gyselbrecht has in mind with Best Kittel. They want to initiate a new breeding project with Best Kittel as the stock breeder, being a world class sprint and shorter middle distance racing bird. This record-breaking crack is possibly the best sprint pigeon in history.